PT Bank Negara Indonesia (Persero) Tbk - BNI (IDX:BBNI) or referred to as "Bank BNI" a is a well-known state-owned commercial banking company in Indonesia. Headquartered in Jakarta, Bank BNI offers a full range of general banking products and services. Its products and services include personal banking, priority banking, business banking, international banking and treasury. Bank BNI is a state-owned bank which is majority owned by the Government of Indonesia Indonesia. As today, Bank BNI is 60% owned by the Government of Indonesia and 40% by public (8.3% domestic and 31.7% foreign). As of December 2016, Bank BNI offers services through 17 regional offices, 196 domestic branch offices, 8 overseas branch offices, 948 sub branch offices, 623 cash offices, 96 mobile services, 17,056 ATMs throughout Indonesia. Bank BNI's overseas offices located Singapore, Hong Kong, Tokyo, Osaka, New York, London, Yangoon and Seoul. In term of financial performance, Bank BNI is running well in the first half of 2017 (1H 2017, ended in 30 June 2017). According to PT Bank Negara Indonesia (Persero) Tbk Analyst Meeting Financial Performance 1H-2017 as cited by JobsCDC.com, Bank BNI succeeded to chalk up a total assets figure of Rp631,741 billion in 1H-2017 up 17.2% increase from the same period previous year of Rp539,140 billion. Bank BNI’s total third party funds in 1H-2017 worth of Rp463,862 billion also surged as much as 18.5% from Rp391,490 billion in 1H-2016. Bank BNI's net income as of June 2017 reached Rp6,413 billion, compared to Rp4,371 billion in June 2016. Maximum age of 25 years old on 14 March 2018. Minimum 1 year diploma program (D1) with minimum GPA of 2.50, majoring in Agriculture related disciplines. Good looking and have strong communication skill. Solid understanding about the business potential in local area (Sumenep, Tuban and Bojonegoro). JobsCDC.com now available on android device. Download now on Google Play here. Please be aware of recruitment fraud. The entire stage of this selection process is free of charge. 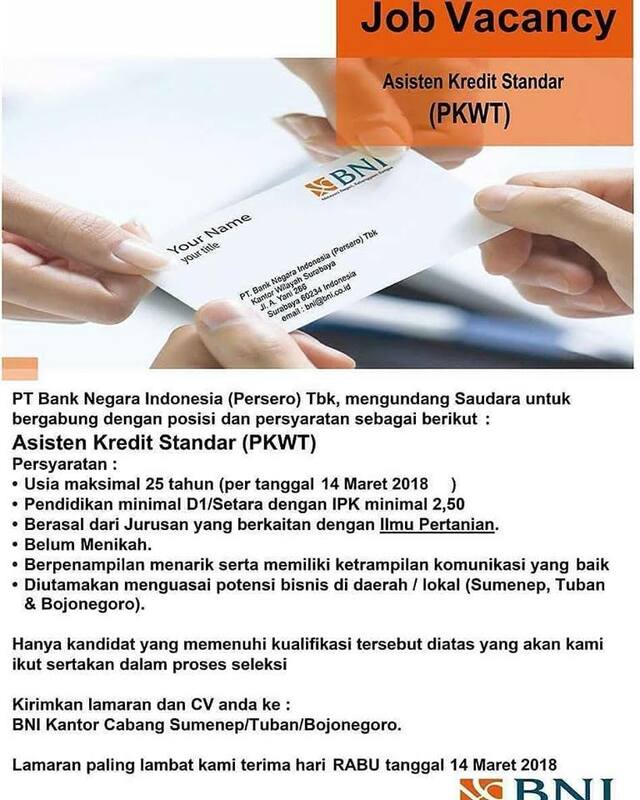 PT Bank Negara Indonesia (Persero) Tbk - PKWT Assistant Credit Standard BNI March 2018 will never ask for fees or upfront payments for any purposes during the recruitment process such as transportation and accommodation.